I work for BPDTS as DevOps Capability Lead. BPDTS Ltd is a dedicated service provider to DWP. We all work together in inclusive, co-located, multi-disciplinary teams towards the same goal, transforming digital public services. We’re passionate about DevOps here at BPDTS. But what does that mean when there are so many different viewpoints on what DevOps is and how it works best? Well, we borrow quite heavily from the methods of Damon Edwards, John Willis and Jez Humble – all significant contributors in the DevOps community – and we reference the C.A.L.M.S. model for DevOps adoption. We have a saying that we’re ‘firmly focused on the C’! By which, we mean that we’re focused on the culture change that DevOps needs in order to flourish. Breaking down organisational silos, empowering our delivery teams, promoting innovation and experimentation (in a controlled manner), embracing immutable infrastructure patterns and designing for failure are all examples of the culture change we’re trying to introduce. We also use the ‘A’ on a daily basis, which stands for automation. From automated build and deployment via modern software engineering practices such as continuous integration, deployment and delivery, through to automating our infrastructure and environments (largely via Containers and Cloud), and full-on test automation that proves the quality of what we’re building, our mantra is ‘automate everything’. 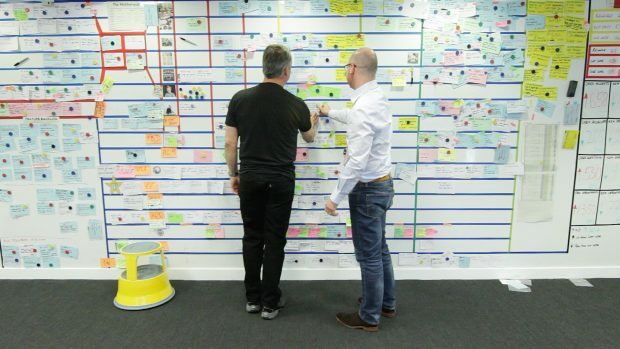 Our use of lean methodology means we weave together agile practices such as Scrum and Kanban, and encourage digital delivery to flow from idea through to delivery using automated delivery pipelines. It helps us to identify bottlenecks that slow down our delivery and encourages us to address areas where there is wasted effort. How do we know if DevOps is successful and contributing to DWP’s goals? Well, that’s where the ‘M’ for metrics (or measurement) comes in. As well as the cross-government measures we adhere to, we also measure a range of things to show if DevOps adoption is a success. For example, cycle time (how long it takes for an idea to reach live delivery); release frequency and release volume; release stability; change failure rate and time to recover; performance improvement and deployment speed. Some of these measurements are already in place and some are things we’re looking to implement very soon. You may be wondering how we do all of this across such a large organisation! Especially when so many other disciplines (Engineering, QA, Infrastructure, Product and Delivery Management, Security, Architecture) are affected by what we do. And that’s where the ‘S’ comes in. You guessed it, S is for ‘sharing’. Here at BPDTS, we’re building our capability using the “practice model, where everyone can build their careers and skills in a community setting. Our DevOps people are key participants in this community model and spend a lot of time at community events across a range of disciplines, talking about what we do and encouraging others to join us on the journey. In a practical sense, we promote hands-on learning and innovation through training opportunities and hackathons. We use a range of channels – such as this blog – to share what we do. Confluence pages, organisational roadshows and internal and external community events such as meet-ups and DevOps days are all part of this. I also host the DevOps North East Meetup group and encourage BPDTS colleagues to attend and to share stories of the great work happening here.